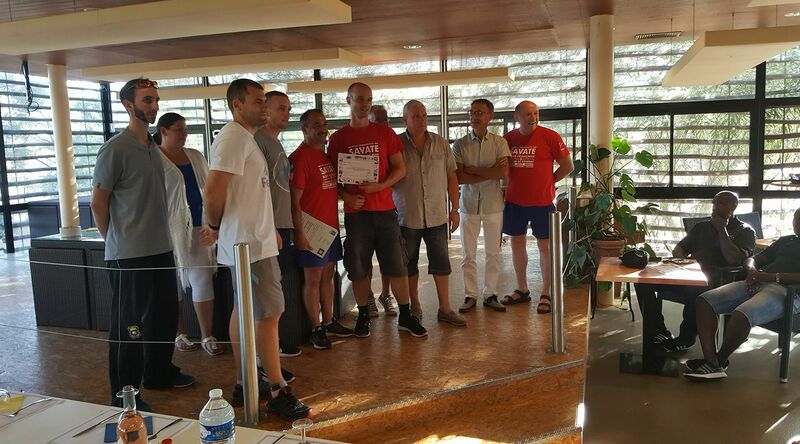 In the first week of July 2017, it was my privilege to attend a week-long seminar – or stage – in Boulouris, on the Cote d’Azur, organised by the International, European, and French Federations of Savate. If it seems paradisaical to be enjoying a wide view of the Mediterranean on a pine-scented hill, under blue skies and palm fronds, then we agree so far; add to this twice-daily technical instruction from several of the World’s finest Savate coaches, plus morning and evening presentations on subjects such as training periodicity, international regulations, and Olympic recognition: if the paradise is still intact, then still we agree. With friends from Finland, Brazil, Serbia, France, Italy, Croatia, Mauritius, and Senegal also in attendance, you might forgive me a tone of delight in reporting back. If anything was a hardship, it was the tough 4 hour Gant d’Argent (Silver Glove) examination on the final day. 18 candidates essayed, 11 were successful. At the Provence-themed buffet and wine evening on what was our last night, I was overjoyed to be awarded the highest score which, I maintain, might fairly have been awarded to other candidates. I very much hope the organisers are already planning a stage along the same principles and ideas next year.